The weather is heating up - it's dusty and hot and the flies are increasing in number. We closed up the house switched on the air conditioning for the first time yesterday, but we've been using the ac in the car for over a month. Outside, I noticed that the fields are starting to turn brown, the springtime wildflowers are almost gone. The kids will finish school in a few weeks and as a result there will be less traffic on the roads for which I will be very grateful! I think we are all tired of sitting in traffic jams and worrying about whether or not we'll have enough gasoline to get back and forth to work and school. From time to time there have been long lines at the gas stations - usually sparked by rumors that demonstrators in Zawia have closed off the supply routes. Today I filled my tank in about 5 minutes, but a few weeks ago I waited in line for over two hours. Now I just make sure to stay topped up. Libya has subsidized gasoline - miraculously, this allows me to be able to fill my car's tank for a mere 8 dinars, which is less than 10 US dollars. 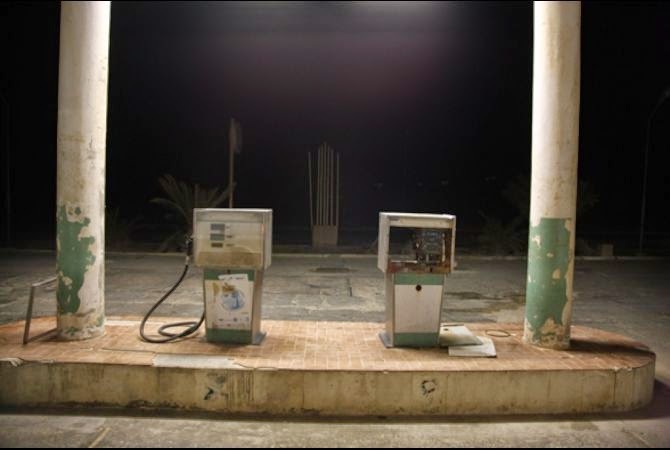 Because of the cheap price of petrol, much of it is smuggled into neighbouring Tunisia for resale at higher prices. Also, the Libyan car market is awash in cheap, used cars (many of them that don't meet any kind of safety standards) - the capital is one big traffic jam. No one carpools, public traqnsportation is basically non-exsistant and the favourite pastime of both young and old is joyriding around town. Much of the day is spent sitting in the car in major gridlock. I read in the news that Libya plans to implement a new 'smart card' system for the purchase of gasoline. Details are still a bit sketchy: In the first stage citizens will be issued cards with their personal data. Everytime you go to the gas station they will swipe your card and this will allow the government to collect data on the public's petrol consumption. Later, after sufficient data has been collected the cards will become mandatory and gasoline will become restricted. It's been suggested that either a weekly (40-50 litres) or monthly (200 litres) quota will be imposed after which you will have to pay the higher, unsubsidized price. Only Libyan citizens will benefit - foreigners will not be allowed the subsidized rate. I'm not sure if the amount is per household or per car - many families own multiple cars. My husband said that there are so many used cars on the market that you can buy 3 cheap, used ones for 10 thousand dinars. Will limiting subsidized petrol help solve the problem of smuggling? Maybe, but what will most likely happen is that everything in Libya will become very, very expensive. Taxi drivers will raise their rates as will bus drivers. The cost of distributing goods will rise, and this cost will then be added to the prices that consumers will have to pay. The cost of everything will increase..... and Libyans will end up poorer.... and they will be stuck sitting at home in their misery because they can't afford to go out joyriding anymore. There isn't much going on in my world these days apart from going to work and then going home. Most days I go directly home and I make sure I get there before the sun sets. Around town: This past week there was a bit of trouble with some people wanting to impose a general strike, but Tripolitanians weren't really interested. The result was that some of the major roads in the capital were blocked in an attempt to cause chaos and force people to join the strike that Benghazi seemed to be embracing. It wasn't very successful in Tripoli - it just turned parts of the city into traffic jams. For the most part, I think people just want to go to work and get on with life. A strike isn't going to do much of anything to solving the myriad of life's troubles in Libya. As for me, I continued life as usual and just made sure to avoid the areas where the roads were blocked. Some problems seem to happen after dark, and thankfully I'm home then. When I'm home: I'm busy with the kids, the garden, the pets. 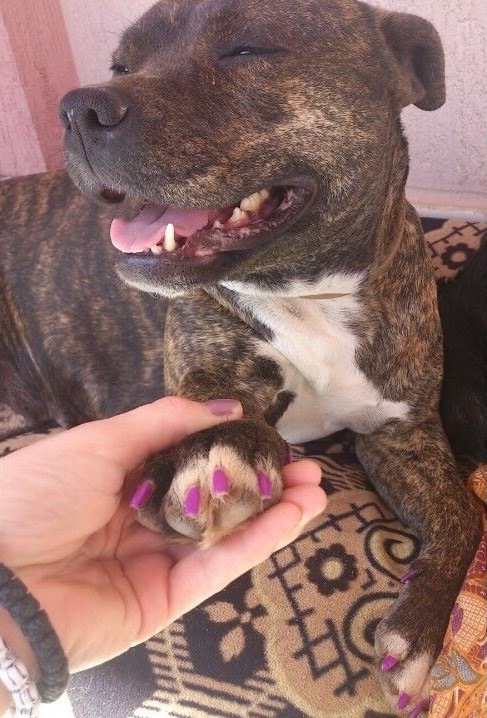 One day Jenna decided to paint our pit-bull's nails... it was so cute, she sat there so patiently having her nails done and look so pleased with herself. She thinks she's a person. Also happening at home: Last summer when I was visiting my family in Florida I took some photos at the beach and I've been meaning to have one that I really liked printed and framed - I finally got around to having it done. Now it needs to be hung, but at the moment it's propped up on the credenza behind my desk. I'm very happy with the way it turned out. 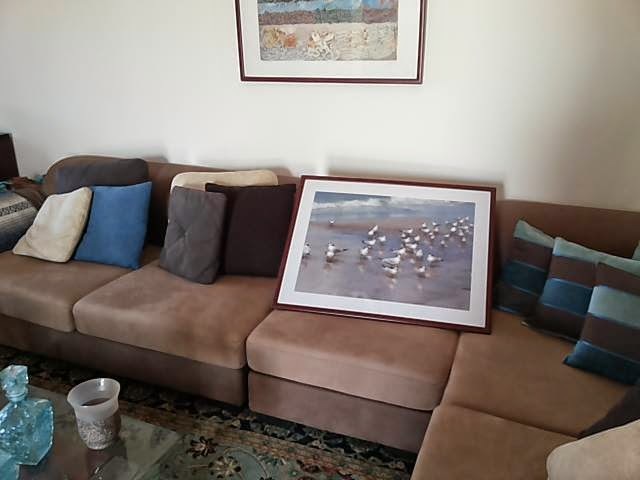 If you are in Tripoli and need something framed I recommend the Art House in Treeg Sikka. Apart from doing framing and selling art supplies the Art House has a gallery and also hosts a cinema club that holds fairly regular screenings of international films. While I was there they said that they were hoping to have art classes during the summer. I hope so because my daughters have been asking me if there is something to do and it would be a great way to pass the time in the heat of the summer. We've been doing crafts at home, but I think if there was a class to go to they'd enjoy it so much more. Thinking back to the past: I took this photo of my friend Tara in 2007 at the Spring Festival in Nalut... has it really been that long ago?... we had such a great time. I haven't heard if there would be a festival or not this year - most likely not. 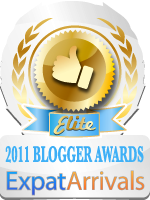 When will it be safe enough to plan such an event? About two weeks ago I met someone who told me 'There used to be a foreign woman that would ride her bike down the highway'.. That was 7 years ago.. people still remember.